Does BBK Performance Parts 3503 fit your vehicle? 3503 is rated 3.5 out of 5 by 2. Rated 4 out of 5 by Bmann from Good quality Good quality part, bolts right on. Only issue i had was i needed to bend the coolant line over because it was hitting but no aftermarket part ever truly bolts on without some type of fab or manipulation. Other than that no problem, looks good and performs good. Rated 3 out of 5 by gmaxwell from not a direct bolt on for a 1994 Ford F350 5.8L. The 2 water pipes are not positioned correctly. Top one hit the EGR plug, the bottom one hit the metal heater line . 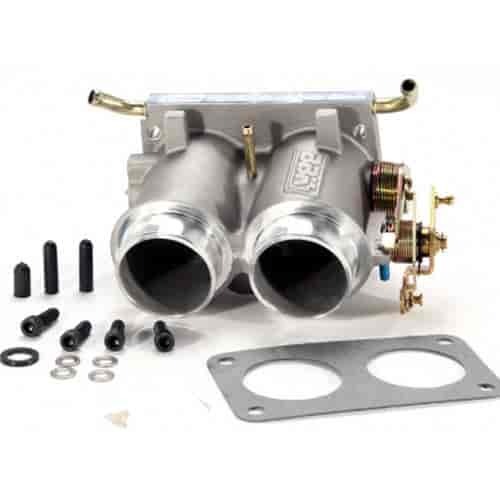 I contacted BBK and they havent had any problems, I sent them pics of OEM throttle body and BBK body and showed the difference. They suggested to try and rotate the fittings, or just leave the hoses disconnected. But even disconnected, the bottom fitting hit the heater tubing, not allowing throttle body to mount flush to intake manifold. So I spent some time and carefully bent the tubes to clear. I was really put out that I spent good $ for a part I had to correct to fit.